Per 4 ounce serving. Vitamin A 9.5%, Vitamin C 9.4%, Calcium 10.3%, Iron 11.1%. Prepared using No Salt Added Diced Tomatoes with Basil, Garlic and Oregano. Saute celery and onion in olive oil until crisp-tender. Add stewed tomatoes to sauteed vegetables and stir together. 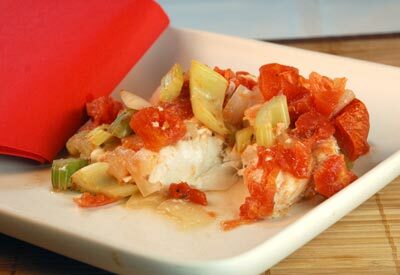 Place grouper in a glass baking dish that's been sprayed with nonstick cooking oil. Pour tomato mixture over the grouper and bake at 350 degrees F for 30 minutes. Remove from oven and sprinkle grated Parmesan cheese over the baked fish. Serve hot.